DHEISHEH REFUGEE CAMP, West Bank — As a mother of four, Abir Zahran needs to know if she can send her kids to school tomorrow. She’s not alone: Throughout this crowded camp south of Bethlehem in the Israeli-occupied West Bank, the Palestinians to whom NBC News spoke on Saturday responded to the Trump administration decision to eliminate U.S. funding to the United Nations relief agency for Palestinian refugees (UNRWA) with anger, questions and resignation. Zahran, who has a college degree in Arabic but is unemployed, is among some 5 million Palestinian refugees who are served by UNRWA. The agency provides schooling, health services and food assistance to the families of those driven from their homes after the establishment of the state of Israel in 1948. This latest decision comes after decades of disappointments that have left Palestinians to confront a failed peace process with Israel, a languishing economy, steady cutbacks in UNRWA services and President Donald Trump’s decision last year to recognize Jerusalem as Israel's capital. On the contrary, U.S. officials claim they're trying to fix a broken system. A State Department statement announcing the dramatic change in American policy on Friday called the agency — which operates in 58 camps in the West Bank, the Gaza Strip, Lebanon, Syria and Jordan — an "irredeemably flawed operation." It also pinned the blame on other countries for not doing enough to support Palestinian refugees. The administration and its allies in Congress also claim that the agency is biased against Israel, overestimates the number of refugees and wastes money. “The real outcome of the U.S. administration’s latest unilateral and reckless policy is the destabilization of the entire region and the creation of unimaginable suffering and hardship for the Palestinian refugees,” she said. In 2017, the United States covered about a third of the agency's budget of $1.1 billion. In January, the Trump administration provided $60 million compared to $364 million in 2017, and called on Palestinians to restart peace talks with Israel. Friday's decision comes as Trump's son-in-law and senior adviser Jared Kushner tries to craft a peace plan meant to launch negotiations between Israel and the Palestinians. The Palestinian leadership cut off direct links with the Americans in November last year, and on Aug. 25 the U.S. announced it was cutting more than $200 million in aid to the Palestinians. Aysar Al Saifi, a novelist who was born and raised in Dheisheh, said in some ways he is relieved that what he calls unquestioning American support for Israeli policies is now in the open, unlike in the past. But he said he is also demoralized that for his entire life he has not been the master of his own destiny, with decisions involving him and his family made on his behalf by others far away. 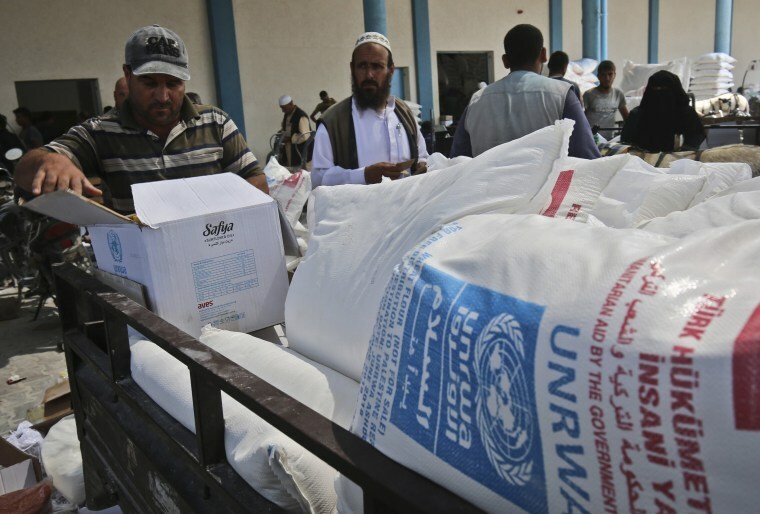 Key to the administration's criticism of UNRWA is the way the UN agency counts the descendants of refugees as refugees themselves. Republicans acknowledge the administration is attempting to remove a pervasive Palestinian belief in the "right of return" — the conviction that refugees and their descendants will one day be able to go back to their ancestral homes. UNWRA "nurtures unrealistic expectations that are jamming up the peace process," one Republican congressional staffer familiar with the administration's thinking told NBC News on condition of anonymity. "It takes the right of return off the table." As grandchildren of those who left their homes in what is now Israel, Al Saifi and Zahran would therefore lose their status as refugees if current thinking within the administration were to prevail. But this belief in the right of return is not easily extinguished by a change in U.S. policy. Raed Othman, a former journalist who now runs Ma’an — a Palestinian news agency — thinks that the U.S. and Israeli administrations fundamentally misunderstand the situation on the ground. “It is a personal issue for Palestinians: You need to convince every single person they are not a refugee,” he said. And the impact of U.S. decisions, along with hardship felt by Palestinians both refugees and not, will reverberate for years.